Complementary, Alternative, Holistic: What’s the difference? In popular usage, and in many academic circles, the terms complementary, alternative, and holistic, are often used interchangeably, but there are important differences between them and similarities. Complementary medicine is, as it states, the use of other methods along with traditional western (allopathic) medicine. Alternative medicine is when one breaks away from the conventional allopathic treatments and uses other types of treatments only, such as Ayurvedic medicine, herbs, acupuncture and so on. Holistic medicine treats not only the specific physical symptoms of disease, but the whole patient by servicing the trinity of mind, body and spirit and as in complementary medicine may use traditional western and alternative. But holistic by far does favor natural medicine but uses allopathic medicine when the diagnosis requires to do so. In my way of thinking the physician and patient are equal partners in the healing process. The patient should take responsibility for his or her own health and use the physician’s knowledge and experience as a guide and when necessary the physician as a life-guard. I consider the term integrative medicine to be synonymous with holistic medicine in that it seeks the appropriate combination of therapies for a particular patient and illness. Again, I repeat that most holistic physicians will integrate the aspect of mind-body-spirit. The holistic physician needs to spend time with the patient, because a large part of a holistic practice is listening to what the patient is not saying, as well as what the patient is saying. This must be done with as much non-judgmental, unconditional love of which the physician is capable, since many illnesses are caused and prolonged by emotional stress. Holistic medicine has as its goal not only the alleviation of symptoms but also the creation of a healthy way of life. There is the perception among some people that by serendipitously using botanicals and supplements they are living a healthy life style. True, they may be doing better than if they were not trying at all, but they may be headed for danger. Botanicals are medicines, and like any other medicine they can have side effects. Certain botanicals need to be taken in proper dosages, which may be different for different maladies. Taking too much can cause toxic side effects; taking too little can mean there are no benefits. This also holds true for supplements. And just like a medical text, a botanical text does not take into account individual differences that must be evaluated by an educated, caring professional. Otherwise, if the client is not considered as an individual there is little difference between indiscriminately writing prescriptions for pharmaceuticals and recommending botanicals and supplements. Also consider this; sometimes a person needs a certain diet or supplement, or pharmaceutical, but this may have to be altered, changed, or just negated as the client changes their life style and gets better. Too often this is not considered and the client is kept on the same regimen for their life. This is expensive and could lead to unwanted side effects. Re-evaluation is important at different times to be judged by the practitioner and the client. This last statement is true for either western medicine or alternative medicine. Developing the art of patience allows the physician to relate on all levels: mind, body and spirit. Sometimes botanicals, supplements, and allopathic drugs are not the answer. The answer may lie in alleviating the stress that is causing or giving energy to the illness. Sometimes the illness has something to teach the patient. All these things are a part of holistic medicine, which may require a referral to another professional with expertise in different types of mind, body and spiritual techniques. Again this is done with the informed consent of the client. It is the patient teaching the physician and the physician teaching the patient that makes holistic medicine such a wonderful relationship devoted to the process of evolving and living without disease. 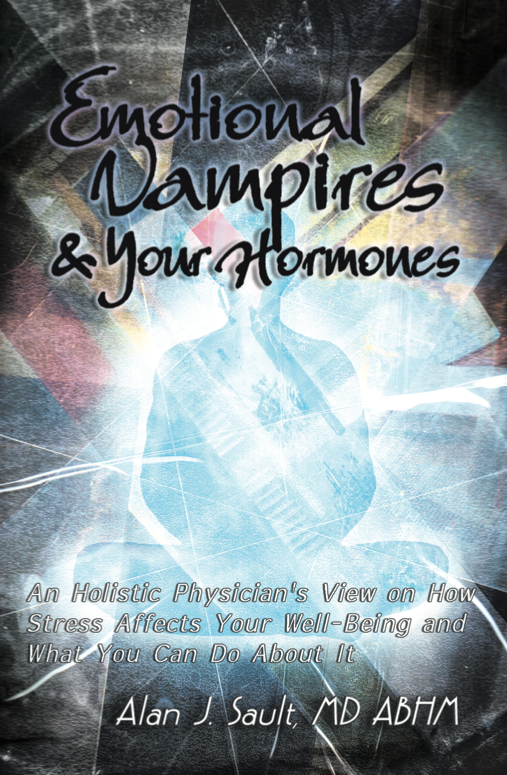 For continuing information on this subject please enjoy reading my published Emotional Vampires and Your Hormones: an Holistic physician’s view of how stress affects your well-being and what to do about it. This entry was posted in Preventive Medicine and tagged alternative medicine, Holistic medicine, Integrative medicine, preventive medicine on May 27, 2015 by Alan Sault MD, ABHM. Too many people including healers think and believe that the term preventive medicine is taking supplements and other alternative treatments. Health is so much more then all the latter: The responsibility should be shared by the client and the healer whether s/he be in traditional medicine or alternative-complementary-holistic medicine. I was not planning on writing on this topic but a situation came up. Two very close people to me went for a complete physical and came back feeling quite secure when the doctor reported to each of them that their health was good except that the sonogram showed mild fatty livers in each of them. No surprise since each of them drinks quite a bit. There were other discrepancies when I reviewed the laboratory reports but that is not an issue in this writing. I will return to the above after my soliloquy on preventive medicine or the lack of it. For quite sometime now it has been obvious to me that it is easier for myself and the client to prevent illnesses rather then try and cure them. Obviously, it is also a lot cheaper for the individual and the insurance companies (but the opposite for the pharmaceutical companies). A mostly healthy life style is the way to live with exercise, live food and stress reduction activities. I say a mostly healthy life style because I find two things with being too strict with ourselves and my clients. One, too strict and the majority will give up their good intentions after a short time of doing what “the doctor ordered.” Two, there is a certain amount of fun in life that we want to have and some of these involve deviating from the path of towing the “gotta do this always for my health”. Three, but really true and important, is I find a lot of “health freaks” become neurotic over every thing they do so they will not get ill. Of course, the latter can lead to stress and can be a sickness in itself. Trying to be completely health-wise in a non-healthy world leads to stress, and stress I believe to be the main cause of disease. Therefore, a self defeating life style There is a possible four, which is what is stated today as the most healthy thing you should do to stay healthy may be proved wrong tomorrow. This is true also for so many pharmaceuticals. I can write a book and not a blog on these but you will come across many in my book and blogs. For now let us just take the example of aspirin which was pushed for so long even though doctors and the FDA knew it was a major cause for bleeding ulcers and its complications like death. Now the AMA is stating not to use it unless you have a cardiovascular condition. But if one believes that today’s health theory may change tomorrow, then one would do nothing to help themselves stay healthy. So lets not go along with that but just note it since one would have to read and study each scientific research article and who did the research to know if something was good or bad and then keep up with current advice about it. Let us hope that reading things like this will give the reader more forethought about spending money because it is advertised as being the health panacea. So we follow a moderately healthy life style and then have to decide which supplements are best for us as individuals. First we must realize that supplements are just that – supplements. They are not a substitute at all for healthy, natural vitamins, minerals, proteins and healthy fats (omega 3s, mono and polyunsaturated fats and some moderate cholesterol intake. (See my blog A Word about Cholesterol). Then we have to watch our pocketbooks, and importantly who is toting the supplement that is the panacea to health. A supplement company should be able to produce a written document on their quality control system and of the item you desire. Another thing I have found that in general the supplements of pharmacies are not as good as those from a reputable company. for example, One-A-Day vitamins. There is no way that a vitamin taken once a day will have the healthy requirement of your body needs. To get the quantity of minerals and vitamins requires 3-4 capusles in the AM and 3-4 at night (in general). The one a day do not have enough for a gerble. OK, Back to preventive medicine and the starting paragraph. This deviates from the way a lot of laypeople and healers view preventive medicine. We have a doctor reporting to clients (I dislike the word patient) that they have good health except for mild fatty livers. They go away confident that they are in good health except for the mild fatty liver. Wrong!! They are ill with a serious pathology. Now is the time to tell them this and for the physician and client to start healing the liver and causes before it progresses to the next stage. This is preventive medicine! The term border line disease is a disaster. The person needs health now. To me, it is like telling a woman you are a little bit pregnant. You are either pregnant or not. A person comes in with a blood sugar that is in the very high normal range. It should signal the physician that another test should be done to check why this is and not say it is still in the normal range. I get a fasting insulin along with the fasting sugar. If the fasting insulin is high that is a signal that there is a problem. Because the body will try to keep homeostasis (equilibrium) so the pancreas keeps putting out more and more insulin to get rid of the excess sugar either by forcing it into the cells or detouring it into fat (triglycerides). So the sugar looks within the normal “boxes” but only due to this compensation. Now is the time for the physician to treat the person so their sugar and insulin go down. Not when the overworked pancreas can no longer make insulin. Not when the person has symptoms and signs of insulin resistance, diabetes or the metabolic syndrome. This would be preventive medicine! A woman comes in with the following symptoms and signs: cold when others are comfortable, lose of head hair and the outer 1/3 of her eyebrows, constipation, fatigue, gaining weight but working out, dry skin and her temperature is less then 96.4 Her lab reports (thyroid stimulating hormone=TSH) show that her thyroid is functioning within the normal range. So what! she is giving the classic symptoms and signs of hypothyroidism or/and adrenal fatigue. This should be followed up by the physician with further thyroid tests. Some holistic physicians would start treating this as hypothyroidism on a low dose (I hope natural) thyroid medicine. Then watch the client, get further tests and a better history especially about the family. This is preventive medicine! Not saying well it is not your thyroid since the labs are normal and putting the woman on menopausal pharmaceuticals and an antidepressant. Prevention is not treating lab work as if it is the patient, but rather listening to the client’s symptoms, signs, history, using what the physician was trained to do. Think about the differential diagnosis; a list of diseases that it could be since the symptoms and signs are similar in so many diseases. Then treat the client and not the laboratory report. Explain to the client what the healers thought process is and get feed back from the client. The client too must take responsibility for getting and staying healthy. It is the patient teaching the physician and the physician teaching the client. The healer should be there as a teacher and as a life guard when necessary. Emotional Vampires and Your Hormones: an holistic physician’s view of how stress affects your well-being and what you can do about it. This entry was posted in Preventive Medicine and tagged Allopathic Medicine vs. Holistic Medicine, preventive medicine, supplements on May 27, 2015 by Alan Sault MD, ABHM.